Dashi furniture construction area of ​​million square meters, the Guangzhou City, one of the largest furniture, stone furniture city brand is long, and convenient transportation. Complete and perfect, the appreciation is very big. 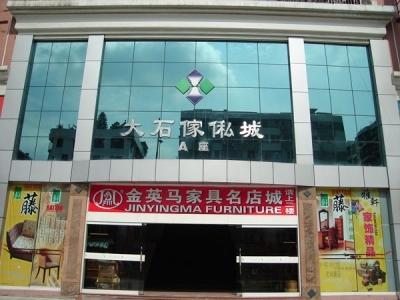 Furniture City, the first stone, two-story commercial occupancy rate has been 100%. Oishi Furniture City has won the "Guangdong Province civilization integrity of the market", "Guangzhou market, consumer satisfaction," the title of great appreciation potential. Dashi Furniture City a total of A, B, C, D, E, F, G Block, stone furniture city close to the urban area of ​​Guangzhou. Posted 105 National Road stone road built. Stretching a kilometer scale, traffic is developed. Stone house private City because of its unique geographical location. a long operating history, bustling business climate, attracting furniture dealers across the country, now more than 10 million square business area, the well-known furniture brands have around Fun to ride to. have refined simplicity of red apple, the famous Hong Kong Royal, elegant fashion feeling fresh, elegant and noble Chinese Lundy high, very creative Stephen Roland, Ruili style of thousands of family, as well as Hong Kong, Arran, new Henley bridge. ACE, 2000, and other hundreds of high-quality design furniture brands.